Although earthquakes have been centered in a number of different parts of Connecticut, the state is best known for its seismic activity near the little town of Moodus. The word Moodus comes from the local Native Americans, who called the locality Machemoodus, which means “Place of Noises”. The Native Americans had long considered the area to be a sacred place because of the booms, cracking sounds and rumbles that often occurred at that locality. The noises seemed to originate beneath a hill that the local colonists called Mount Tom. In the 1980s, scientific data confirmed that the Moodus noises are the sounds of small earthquakes that are taking place less than a mile below Mount Tom. The Moodus earthquakes tend to be concentrated in earthquake swarms, when many small events are heard and felt over the course of several weeks or months. During the 1980s, several earthquake swarms took place at Moodus, each of which lasted a few months and were documented to consist of well over 100 small earthquakes. Not all of the earthquakes at Moodus have been small. On May 16, 1791 at about 8 p.m., all of Connecticut as well as parts of the surrounding states were rocked by an earthquake. In the Moodus and East Haddam area, some chimneys were reported cracked and some stone fences were reported to be thrown down by the earthquake. Some cracks in the local soil were also found. To the west, this earthquake was felt as far as New York City and Albany, and it was felt in Boston to the northeast. This earthquake was followed by a large number of small shocks during which the Moodus noises were heard. The 1791 earthquake at Moodus is estimated to have had a magnitude between 4.4 and 5.0. There have been some notable earthquakes in other parts of Connecticut. On October 26, 1845, an earthquake was centered in the Bridgeport and Norwalk area. In addition to being felt strongly in those towns, this event damaged stone fences in Weston and rang a church bell in Westport. Its estimated magnitude was about 3.9. On August 9, 1840, an earthquake was felt across all of the state. The ground shaking at Hartford was so frightening that people rushed from local churches, which they were afraid would collapse. The location and magnitude of this earthquake are not well known, but the best estimate of the epicenter is somewhere near Hartford and of the magnitude is about 3.8. Small earthquakes have been centered at a number of localities along the south coast of Connecticut, in the western part of the state, in the north central part of the state, and near the border with Rhode Island. 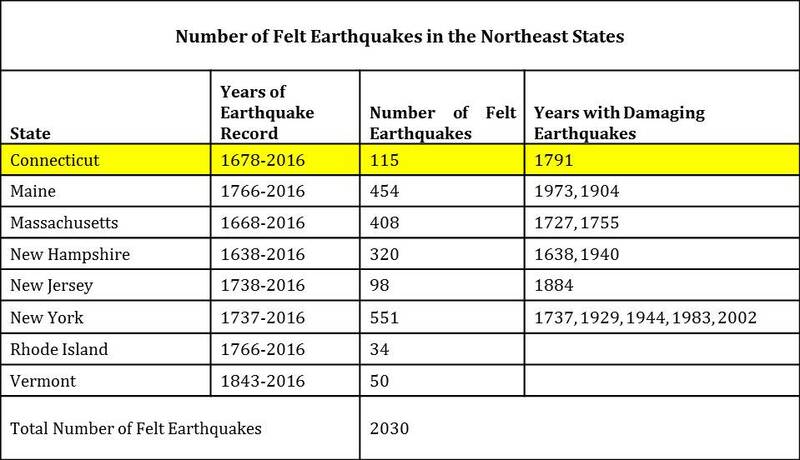 Since the first earthquake in February 13, 1678, more than 115 felt earthquakes have been centered in the state through 2016. Furthermore, Moodus is not the only place in Connecticut to have experienced earthquake swarms. A swarm of well over one hundred small earthquakes took place at Wauregan, CT between October 2014 and July 2015. The most energetic part of the swarm was in January 2015, with the largest event being a magnitude 3.1 earthquake on January 12, 2015 at 6:36 a.m. These earthquakes caused no damage but frightened local residents. Several strong earthquakes that were centered outside of Connecticut were felt strongly in the state, although none caused damage anywhere in the state. The magnitude 6.2 Cape Ann, MA earthquake of November 18, 1755 caused strong shaking throughout the state. The same is true of the magnitude 5.6 of October 29, 1727 earthquake that was centered at Newburyport, MA. The earthquake of August 10, 1884 that was centered near New York City and had an estimated magnitude of about 5.0 was felt quite strongly in southwestern Connecticut and noticeably in the rest of the state. 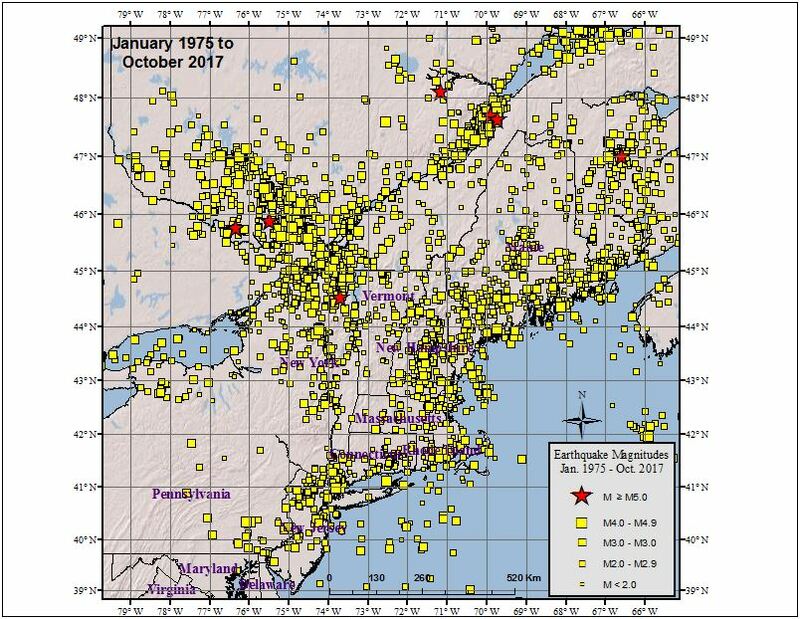 Other, more distant earthquakes that caused notable ground shaking in Connecticut were the March 1, 1925 magnitude 6.2 earthquake in Quebec, the September 5, 1944 magnitude 5.9 earthquake at Massena, NY, and the magnitude 5.6 earthquakes on December 20 and December 24, 1940 at Ossipee, NH. The August 23, 2011 magnitude 5.9 earthquake with an epicenter at Mineral, VA was felt strongly throughout, although it caused no damage in the state.